The VAXE Variable Attenuators are waveguide components for tunable signal leveling or reflection compensation in waveguide networks. The Attenuators consist of waveguide section with a resistive film evaporated on the mica surface. 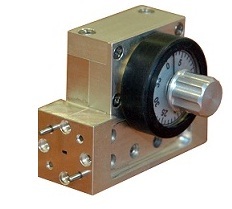 The Attenuators has 0 ÷30 dB minimum attenuation range. The VAXE Attenuators are available in four waveguide bands between 33 GHz and 170 GHz. Variable attenuator for 33 - 50 GHz frequency range, silver plated.